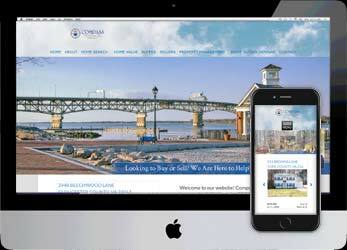 At Richmond Media, we specialize in branded business websites, with an emphasis on content management, social media and search engine optimization. We blend web presence with other digital media for brand cohesion. We are also experts at rebuilding older sites. We have been creating websites for all kinds of businesses for over 15 years All websites are not the same and we’ve learned a lot about sites for different kinds of business. We’ll help in every aspect of your project. We’re affordable, we build custom content management sites, various e-commerce systems and more. 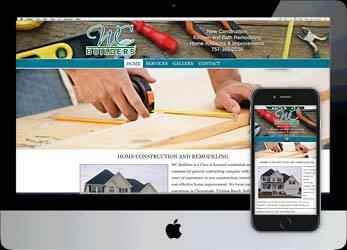 Our sites are all responsive and include a fully functional mobile version. 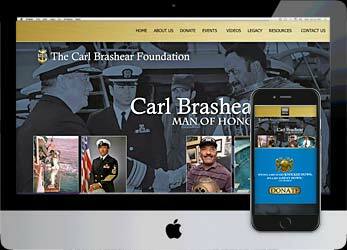 We were honored to have the opportunity to design a new website for the Carl Brashear Foundation. Carl Brashear was the subject of “Man Of Honor”, a major motion picture starring Cuba Gooding playing Brashear as a U.S. Navy Master Diver, rising to the position in 1970 having an amputated left leg. The film Men of Honor was based on his life. The site includes upcoming events, videos, resources and a donation portal. 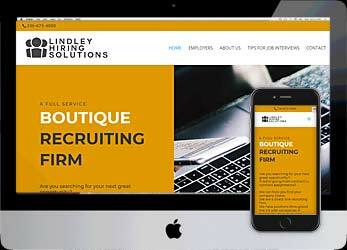 Lindley Hiring Solutions is a boutique recruiting firm located in North Carolina. We set up the website so the client, Renee Lindley, could maintain everything herself. Job descriptions and an application form are right on the Home page. The site also features pages for employers, tips for job applicants, a page about Renee’s history anda list of [positions filled on every page. 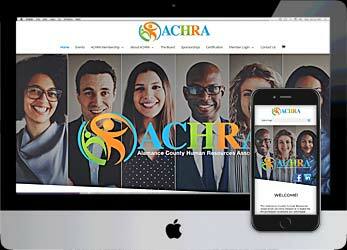 The Alamance County Human Resources Association (ACHRA) is a North Carolina HR organization that had a small place in the website of a state spo0nsored group.. We built a new site and moved it to its own domain. We also set up dual purpose event payment e-commerce, with members getting different prices than guests. 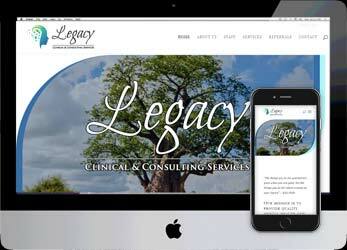 Legacy Clinical & Consulting Services is a new counseling/advocacy group in Hopewell, Virginia. We worked with them to develop a website that provides information about the practice and the other things they do. We designed their logo and set up the branding for their business. Included are referral and Contact forms, in addition to a large location map on every page. 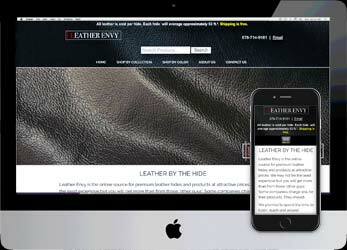 An e-commerce site for a company that sells leather by the hide. This website was a challenge because they wanted to split products into both collections and sorting by color. we had to build both sections manually instead of using the standard WooCommerce creation process. But we did it! 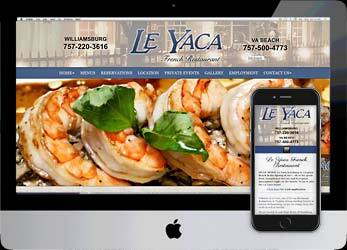 We rebuilt the very popular Le Yaca website to add a new restaurant location.. This WordPress site features a job application, Google Map to both locations, food gallery, menus, and a history of the restaurant. This is one of the highest traffic restaurant websites in Williamsburg. 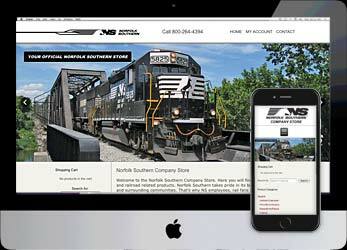 Norfolk Southern Railroad gave us the opportunity to rebuild their popular Company Store, where people buy branded items, memorabilia and other railroad themed products. We built the website to look similar to their company website, configured a new e-commerce system and uploaded all of their products. E-commerce features include sale pricing, product search, user friendly checkout and pricing by apparel size. The Compass Real Estate website uses a full version of iHomefinder, a system that parses the MLS database to allow for extensive search functions, advanced search capabilities, property slideshows, valuations requests and more. The site also offers home buying seminars, resources for buyers and sellers and other features. 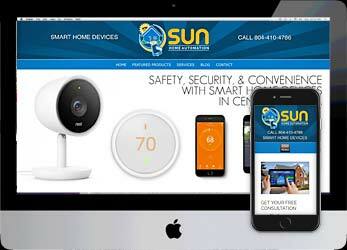 Sun Home Automation enhances the home environment using Wi-Fi enabled controls and convenient smart phone apps. Their website uses high resolution graphics, video and parallax background images (scroll down the Home page to see) to present a high tech, modern look. 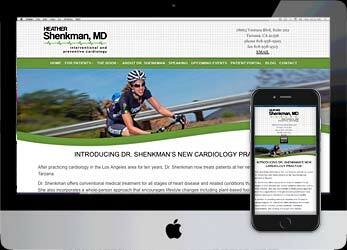 We created a dual purpose website for California cardiologist Heather Shenkman. She started a new practice, and as a vegan/athlete, she wrote a book about healthy choices. We promoted both the new practice and the debut of the book. Her new site also links to a long running blog. 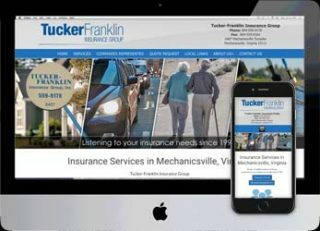 Tucker Franklin Insurance Group is a small site, but we put a lot of time into making it pop. Services, companies represented, a quote form, local links and other features were requested by the client. We actually like budget sites. They’re direct and simple, and a graphic challenge. This small site has all of the essentials for a restaurant. 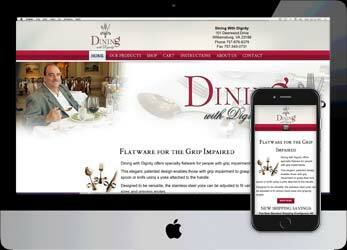 Menus, location and a contact form are features of this basic website. A delightfully quirky website for a psychiatry practice. They had some… interesting ideas, so we let them run with it. Eye candy and lower case fonts abound, this site should get some love from their site visitors. Ironbridge Sports Park is one of the largest sports parks in the Richmond, VA area. We built them a website big enough to show off their property. A large Home page slider with Ken Burns effect, pages for each attraction with large tiled Galleries, forms for special events, a park map, and an embedded location map are just a few of this website’s many features. 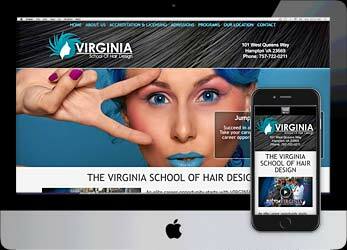 Our talented partners at Duke Communications asked us to redesign the Virginia School of Hair Design’s website. We gave them a thoroughly modern look with a Ken Burns effect slider and page wide Home page content. We also updated their site content and added a large embedded location map, a contact form and a mobile friendly site. 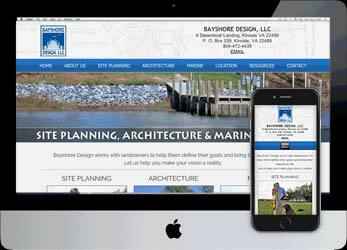 Bayshore Design called about fixing a very old, obsolete WordPress website. We ended up giving them a full makeover, with high resolution graphics, multiple services pages, a great mobile site and more. 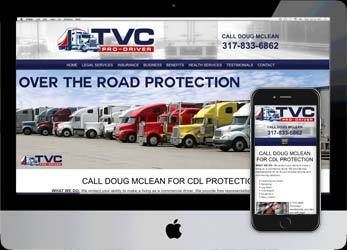 This website was created for a salesman who sells insurance protection for long haul truckers. We had to wade through a mountain of promotional material to cull the best parts for the site. You can look through the pages and see the client’s selling style. 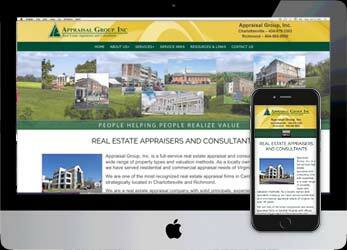 As real estate appraisers, we kept the design very conservative, basic and professional. The site contains lots of technical content, in addition to multiple Services and company pages. We used lots of click to enlarge images to show the scope of work for this company. Holly Rolley’s Williamsburg Real Estate Pro website uses iHomefinder to better show MLS features. This site is heavily customized, with multiple community pages featuring available properties, Advanced Property Search, a Valuation Request page, a Gallery and more. 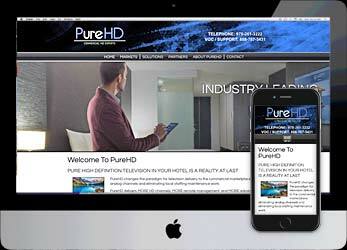 Pure HD is an Atlanta based company that provides high-definition television and streaming experience to the travel industry. This website was designed to the client’s specifications, and includes their services and products the way the client wanted them shown. The site is also maintained by the client. 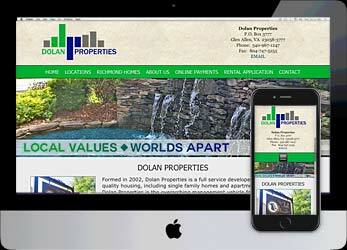 Dolan Properties is a central Virginia company with many rental apartment properties. Not only did we set up pages for those properties, we also set up an e-commerce system to allow renters to pay their rent online. Even cooler was their online rental application, which not only has a digital signature field, upon clicking Submit, it sends the user to PayPal to pay the application fee. This client had a website that was positively ancient. We took lots of the text content and replaced all of the old, tiny images with high resolution graphics. We gave the Home page lots of parallax eye candy. 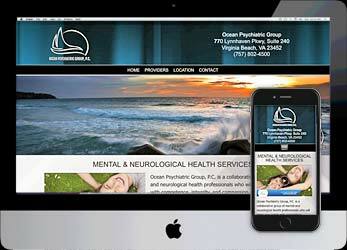 Ocean Psychiatric is a Virginia Beach, VA based psychiatric practice. This small website has an embedded TC ad on the Home page, a list of providers and their bios, an embedded Google Map with door to door driving directions to the practice and a Contact page. We also took a very old, corrupted version of their logo and cleaned it up. 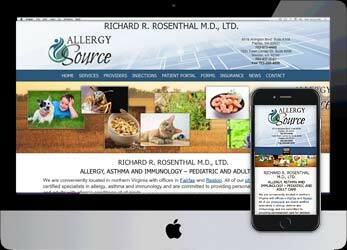 A large allergy practice with two offices in northern Virginia, their large website includes a patient portal, a variety of online forms, providers’ information, services and embedded online maps to both office locations. Douglas Dye also developed their new logo. 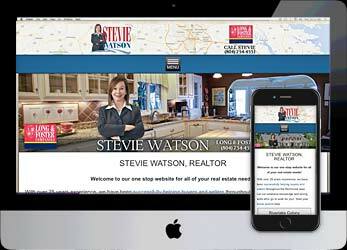 Stevie Watson is a real estate rockstar, finding great success in the Tuckahoe area. To make her site as informative and interactive as possible, we set up the iHomefinder system, which works with the local MLS to display properties in many useful ways. We built a budget website for H.O.P.E. Counseling and Consultation Services. The site itself is simple, in order to make site visitors focus upon the site content. In addition to a large embedded location map with door to door driving instructions, the site has four separate forms for potential clients, prospective employees and referral candidates to submit. 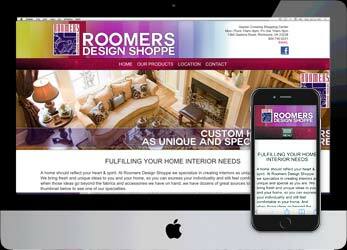 Roomers is a delightfully quirky interior design shop in Henrico, Virginia. We created a very colorful theme to highlight the look of their store. The Home and Products pages are image based instead of text based, so clients can easily navigate their selection of product categories. Eight product category pages are a blend of text, images and image galleries. 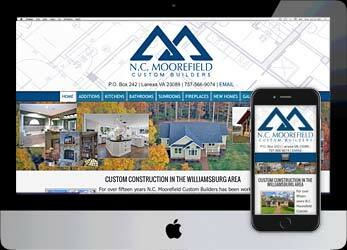 N.C. Moorefield Custom Builders is a Williamsburg based construction firm. This budget site uses their collection of images to create 3 Galleries, a Services Gallery and 2 “step by step” new home construction Galleries. We also expanded their Contact form for use as a Request A Quote form. A craft brew bottle shop & growler bar, The Bucket Trade has two locations, and is a fast growing business. They rely heavily upon social media, so we put their Facebook feed on the Home page. 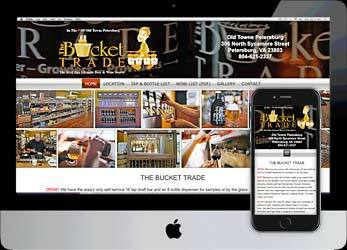 We also integrated their website with their Trinkin listing for their tap & bottle list. 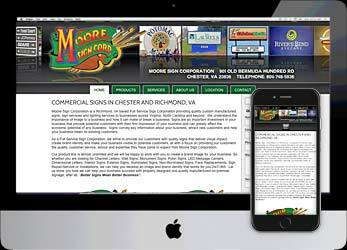 Moore Sign Corporation is a large commercial sign company in Chester, VA. The site includes many high resolution galleries of their work, custom head tag graphics to give the products an individualized look, and a gallery of their Potomac Mills sign, at the time, the largest flexible face sign in the world. 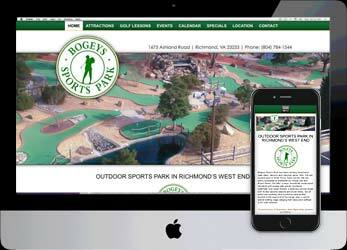 Bogeys Sports Park is a large, modern website for a Richmond area driving range / batting cage / miniature golf venue. The site features Request Forms for group outings and birthday parties, and includes a large embedded Google Map and Google Event Calendar. 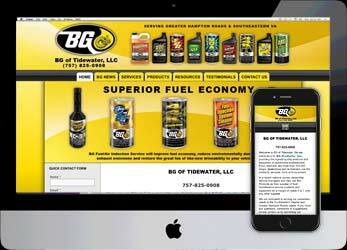 BG Of Tidewater is a BG Auto Products, Inc. reseller. This website is video rich, with lots of resources about their various products. A tricky job, because some of the things on the site don’t work well on mobile devices. We made it happen. A HUGE rebuild for an old client, we took Greenleaf Landscaping to a new level with high resolution Galleries of their services, job examples and before and after projects, Quick Contact forms and more. The Home page features a modern, high resolution slider. 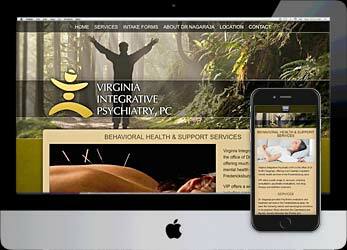 Virginia Integrative Psychiatry (VIP) is the office of Dr Sudhir Nagaraja from Fredericksburg, VA. His practice had a very old, obsolete website. We gave him a budget website with an embedded Google map, downloadable PDF intake forms, a Contact page and his bio. 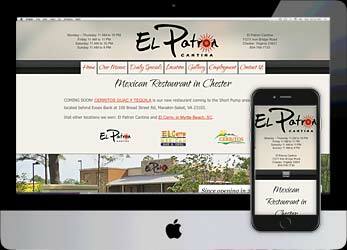 El Patron Cantina returned as a Richmond Media client, and we created something different for them. Their Home page is a series of animated sliders that scale into place with a “Ken Burns” effect, linking to the most important pages on the site. 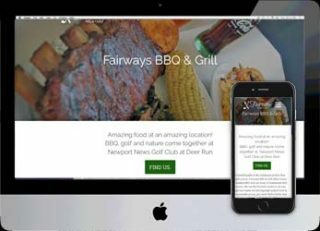 Features include a tabbed menu page, an embedded Google Map with door to door driving directions, a tiled Gallery page and a Newsletter signup link. The website uses custom fonts throughout, and links to their social media. 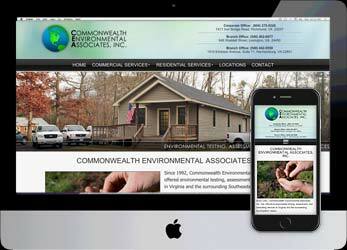 Commonwealth Environmental Associates, Inc. offers environmental testing, assessment, and consulting services in Virginia. This WordPress website features anchor links for Commercial and Residential Services pages (13 in all), multiple maps to their various offices and a Contact page. 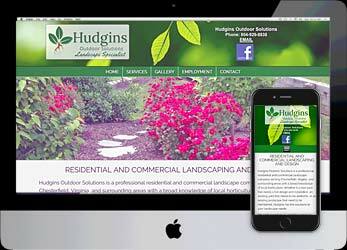 Hudgins Outdoor Solutions is a professional residential and commercial landscape company serving Chesterfield, VA. This budget website includes a Services page, a Gallery and an employment application, in addition to a large Home page slider. 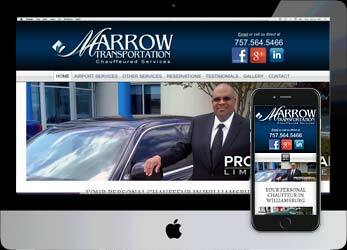 We upgraded Marrow Transportation’s old site with a mobile version, a Gallery, testimonials, online reservations and social media. Cecil Marrow has been a client of ours since 2008, and we always try to take great care of his online needs. 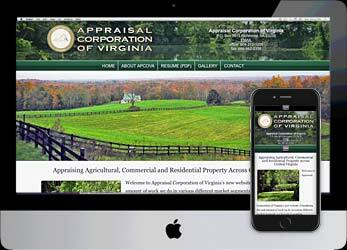 Appraisal Corporation of Virginia is a Virginia appraisal company that wanted a budget, businesslike, modern website. We used a graphically rich design, and the site features a Gallery, resume, social media and a Contact page. An e-commerce website that sells specially designed eating utensils to people with grip impairments, we built product lightboxes and integrated with the client’s bank for the online ordering system. Included are instructions, articles, links and a contact form. 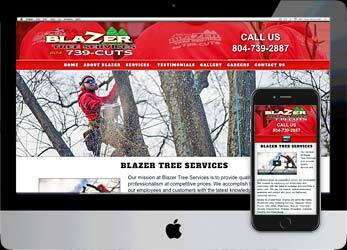 Blazer Tree Services just updated their website to a budget content management WordPress build. This website is a great example of what you can do when you have stunningly good images to use. The site features a beautiful Gallery, an online job application, Services, About Us pages and more. 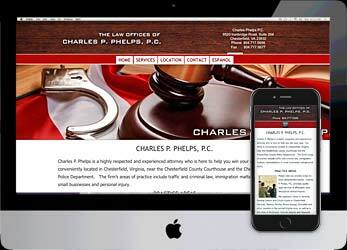 Charles P. Phelps is a highly respected and experienced attorney in Chesterfield, Virginia. This budget site features services, a Contact form and an embedded Google map to his office. The best feature is that the site is bilingual, offering both English and Spanish versions. 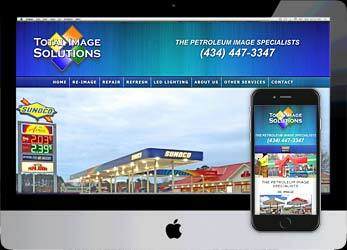 Total Image Solutions had an important industry convention coming up, and they needed a professional website ASAP. We used their existing media and worked with them to develop website content on a tight deadline, going through several logo changes and lots of last minute edits. We brought the site live with three days to spare, and they client was able to showcase their business in a professional manner. 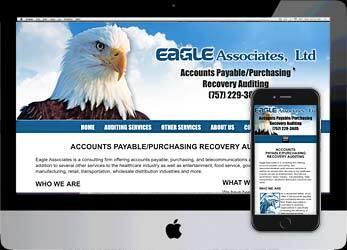 A budget WordPress rebuild of an auditing company website we originally created a few years ago. They wanted a mobile friendly site and we delivered. We had to resurrect it from its original version, requiring a complete code makeover. With so much text on the site, we kept the design as utilitarian as possible. 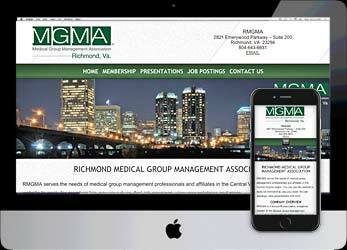 RMGMA is a non-profit association, a regional chapter of the Medical Group Management Association and an affiliate of the VMGMA. This website includes PayPal payments for dues and events, membership information, past presentation documents, job postings and more. Heather Moorefield’s Williamsburg Real Estate Sales website is a budget effort compared to the toehr real estate sites shown here. It doesn’t include iHomefinder, instead relying upon local MLS data. Still, the site includes community listings, buyers and Sellers pages, along with everything else you would expect from a local real estate agent’s website. 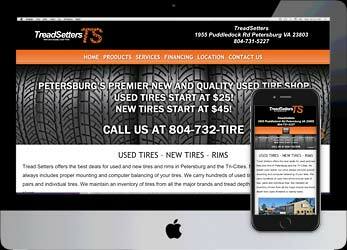 Treadsetters is a used and new tire store in Petersburg, VA that also offers rims and other products. The site includes multiple products and services pages, a Financing page with a link to prequalify, an Appointment form and a location map. A bit larger than a budget site, this is designed for a local music teacher in Bon Air, VA. The site features information about lessons, various teaching methods and a map to her studio, in addition to a very large Home page image and a Contact page. WC Builders is a Class A licensed residential and commercial general contracting company with over 16 years of experience in new construction, remodeling and cost effective home improvement. This budget website features a Services page, a Gallery of their work and a Contact page. 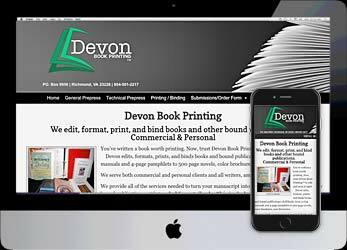 Devon Book Printing is a much larger website than it appears. Lots of pages about the business and the printing requirements, a voluminous order form with a detailed explanation. a custom FAQ page and more round out this large, but unusual website. 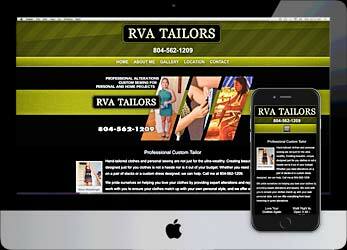 RVA Tailors is a budget site that still includes some nice features. A nested Gallery, a large embedded map with driving directions, a page for offers for discounts and two contact forms help the site to do what it needs to do for the client. 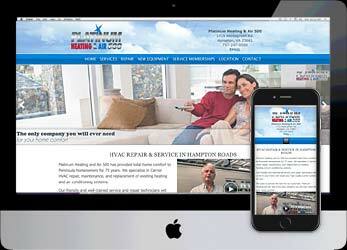 This is a rebuilt site for Platinum Heating & Air 500, a Hampton VA based HVAC company. The site features a video on the Home page, quick contact forms throughout, and custom headers. MD Liaison is a medical networking company that also books regional conventions, working with physicians and other specialties in Virginia. We created a complex registration system for convention attendance to replace one that was old and not working well. Madel Enterprises is a Richmond area technology company. We stepped out of the box with a unique look for their design. We were able to do this because their site content was miles and miles of text, rather than a lot of images to design around. We used the “fading away” background design to add a strong visual element to the volume of text. Pinery Water Management is a Colorado based water company serving a large port of the state. We took the content from their old site, updated it, and put a website together that can be easily accessed by their customers. We streamlined their navigation and split the pages into more relevant groups for ease of use. Branch Fields is a renowned opera singer, who also appears in plays, musicals and television. We set up a budget site that includes a tiled gallery, videos, audio files, his schedule and a page for reviews of his work. Since we didn’t need to worry about search engines we were able to take some artistic liberties with the Home page. Another collaboration in our partnership with IIr Associates Inc, The Dinwiddie County Water Authority (DCWA) is a water management company in central Virginia. We updated their very old website to a modern WordPress build, with lots of PDF content, FAQs, location map, links to water bill payments and much more. Darden Publishing produces glossy magazines about Hampton Roads. This website features past issues for site visitors, options to buy the magazines, advertising and media kits. A lot of the content is from Issuu, a digital media provider. Keil Services is a company that specializes in both plumbing services and bathroom remodeling. The challenge was that the client had virtually no images of their bathroom remodeling jobs. We were able to use purchased artwork that remained true to the kind of work the company does. First United Methodist Church of Hampton, VA has a large congregation with many needs, and a large website. 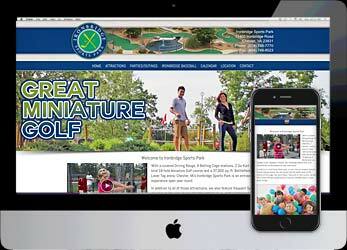 We created a new WordPress content management system and upgraded all images and other media. we also updated all of the text content to fit the modern design and the mobile version of the site. 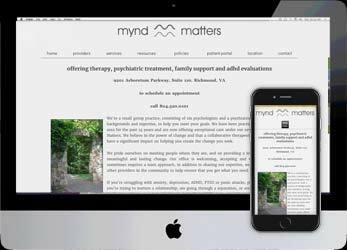 A budget website for a psychiatric practice. This WordPress site includes About Us, Providers, Location and Contact pages. We found that Google Maps had an error in the location of one of the practices, and we found a way around it by using longitude and latitude values instead of the actual address. Obsidian is a small engineering firm that didn’t need a website. What they needed was an online contract that could be digitally signed by their clients. We built them a two page site that included the contract as a form with a digital signature that they could download as a PDF. A WordPress website for All Things Accordion, we built a site that features pages for bands, solo work, lessons and events. Other pages include videos, Featured Player, Gallery, resources and a For Sale e-commerce page. One of the sites we built in our partnership with IIr Associates Inc, Chenault Veterinary Hospital has three locations in central Virginia. We set up monthly specials, a form for people to upload images of their pets, embedded maps and information pages about the staff, services and more. Lucky 13 is one of the biggest, most successful tattoo/body piercing parlors in Richmond, creating the site was a blast. Based upon the belief that potential customers would love to see lots of examples of previous work, the Gallery contains almost 300 images. Neptuna Fishing Charters is a Key West charter service that lost control of their own old WordPress website. 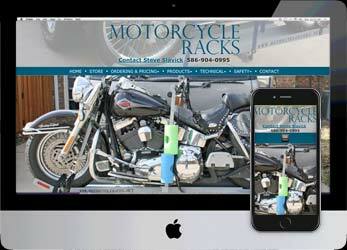 We were able to create a completely rebuilt site without the benefit of hosting or FTP logins. The site features a page about local fish, an online booking form, and ages about the charter and the boat. Potomac River Oyster Company had an old Joomla e-commerce website that wasn’t working, and they had no SEO. We rebuilt the site in WordPress, added a custom e-commerce system based upon ZIP codes, and added effective SEO to improve their ranking. All for a budget price! The Casselton Program is dedicated to treatment of alcohol and substance abuse by providing outpatient services to adults and older adolescents. We gave them a budget website that works for both of their office locations, describes the various programs, and encourages potential clients to contact them with questions.. Pulmonary Associates of Richmond is a large practice with 4 locations and over thirty providers. This website features location maps, several FAQ pages, provider information, admission forms, online portal logins and much more. We also build a private resource website for the company. Explore Hilton Village Is both a historical resource and a business directory for the Hilton Village area in Newport News, VA. Features include full screen galleries of rare photographs of the construction of Hilton Village, articles about the area and an extensive, searchable database of local businesses. Endless Resorts is a companion site to GoodBuy Vacations as they transition to a travel agency with multiple services. The older timeshare content remains, but isn’t featured as much as the newer services they offer. We use the same strategy of request forms that we used on the GoodBuy Vacations website. Terry Dentistry is a budget site for a South Chesterfield County dentistry practice. Featuring embedded video, information about dental care, practice info and a short Appointment form, the website also has a header slideshow. Like all of our websites, automatic backups and extra security is included. Winning Colors is a delightfully quirky website featuring a self help/team building program. This very large website includes exercises, music downloads, lessons, testimonials and more. The creator, Stefan Neilson, also blogs regularly on the site. Rock Landing Therapy upgraded from their budget site to a modern web presence featuring online patient intake forms, a WordPress blog, a resources page and more, with extensive search engine optimization. Cabinet Restoration is a Williamsburg based cabinet restoration company. They rebuild cabinets for fine homes in the area. The site features high resolution before & after and Portfolio galleries, and includes a header slideshow. This is a small website for a Hilton Village catering company, and it is gorgeous! A large gallery and “Book An Event” forms are featured here, as are packages, reviews and listings of services. This is a budget website done right. Delmarva Board Sport Adventures is a company that rents and sells water sports equipment, and excursions. Their rebuilt WordPress site features a Zen Cart shopping system, maps to tour launch sites, 2 blogs and more. RTG & Associates is a group that secures funding for veterans’ higher education. We built them a content management site that allows them to keep their courses and registrations up to date. There is a separate back end registration system that was customized to fit with the design. 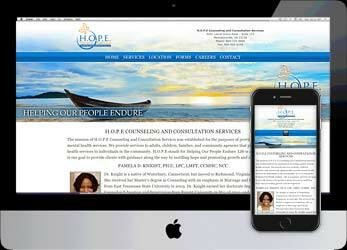 HRCPI is a counseling service in Hampton Roads. We built a new WordPress site with custom headers, an appointments link, an embedded Google Map, a job application, a blog, and Quick Contact forms on every page. Hubbard Bros. Inc., Tree Consultants is a tree care company in Yorktown, VA which has been around for over 45 years. We gave them a WordPress site with an embedded Google Map, a Gallery, job application and a specialized Contact form for potential clients. Advanced Temporaries is a temporary staffing agency with offices in Richmond and Norfolk, VA. Features include sections for clients and job seekers, application and staffing request forms, and embedded maps to both offices. 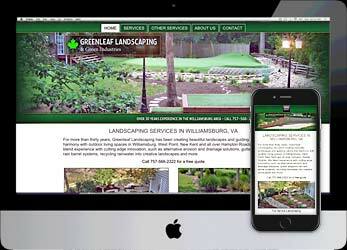 We upgraded Landscape Elements’ old website to a bold, colorful WordPress content management system. The site features large broadband slideshows of their work, social media interaction, testimonials and other features. This is a website for Proctor Trivette, a sound recordist for movies, television, documentaries and commercials. This is a business to business site, so we didn’t have to use a lot of text on the Home page. This allowed us a rare chance to use an artistic approach in the design. We built this budget website for Hotel Parador Oasis in San Germán, Puerto Rico. They wanted a website they could link to from travel directories and booking engines. Features include an embedded Google Map with door to door driving directions and a small Gallery. This is a Joomla content management system built for Obetech, a Richmond, VA based biotech firm that does obesity research. Set up to be edited by the client, this site will also feature a shopping cart for testing kits. Square 1 is a construction firm specializing in government, industrial and commercial work. This site features satellite views of job sites, case studies, current projects, contact forms and more. We also did search engine optimization. A website for modern rock band Rich Whiskey. Including their schedule and songlist, photo galleries, video, a contact form and links to their other social networking sites. This site has been updated with WordPress, and is maintained by the band. My Map 4 Success is a WordPress website that promotes workshops for personal growth, using the Winning Colors system. This WordPress site features an online store, videos and social media. 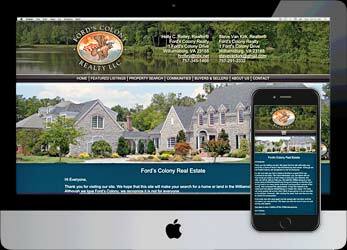 Diversified Investment Realty needed a budget site that looked “big”. 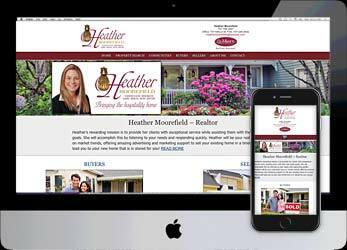 We set them up with a site where they could update and maintain their own listings. They are currently building their site with our assistance. Resource One Financial Advisors wanted a website built to their own vision, so we took their ideas and streamlined them into a website that met the criteria for the industry. A broadband speech from the President is included.